Occasionally a book comes seemingly from out of nowhere to grab you by your heart and mind and leave a permanent impression behind when you’re finished. The Tusk That Did the Damage is just such a book. I was not familiar with Tania James or her previous books (a novel, Atlas of Unknowns, and a story collection, Aerogrammes) when I was contacted a few months ago by TLC Book Tours to gauge my interest in reading her latest novel. The premise sounded intriguing and, if carried out to its potential, capable of being a powerful read. I agreed to read it in exchange for my honest opinion (other than sending me an advance copy of the book and setting a date for me to post my review, TLC has not contacted me). Tusk far exceeded my expectations. It is a masterful work that explores the various aspects of the illegal ivory trade in southern India. By combining timeless conflicts among humans and between humans and both the animal kingdom and the natural world, James has crafted a book that will hold most readers spellbound. James uses a three-pronged narrative to provide readers with a panoramic view of life in the highlands of southern India, where elephant poaching is widespread. The first narrator we encounter is “The Elephant,” known as the Gravedigger. He was orphaned as a calf and raised to be exhibited, but his years of mistreatment have led him to escape his captors for a life of freedom and revenge. When the opportunity is presented, he kills humans and “buries” them and attempts to cover them with brush, virtually “erasing” them in the process. Then we are introduced to the first-person narrative of a studious and ambitious young man named Manu, who has known only a life of extreme poverty and abuse as the son of a rice farmer. The third point of view is provided by an American documentary filmmaker, Emma, who has recently graduated college and, along with her best friend, Teddy, is attempting to make a film about an Indian veterinarian who is attempting to rescue elephants calves and reunite them with their mothers (who are said to reject calves if they have had contact with humans). The three narratives circle each other warily, eventually moving toward each other. Manu’s older brother Jayan is a small-time criminal who is part of a large poaching ring. Manu dreams of education as his escape from a life of few options and struggles to stay out of Jayan’s life. While nothing truly excuses the ivory poachers, we learn what drives them to destroy these incredible creatures in order to obtain their valuable tusks. Emma and Teddy work together almost telepathically, but their project is complicated by Teddy’s developing interest in Emma and, more crucially, Emma’s attraction to subject of their documentary, Ravi Varma, the head veterinary doctor at the Wildlife Rescue and Rehabilitation Center on the edge of the Kavanar Wildlife Park. Manu’s life changes when the Gravedigger kills and attempts to bury his cousin and best friend, Raghu. Manu was supposed to have been with Raghu that night and knows he would have been killed as well, leaving him haunted by survivor’s guilt as well as sadness and anger. James weaves the plot strands together, turning the screw steadily toward the story’s inevitable tragedy. For The Tusk That Did the Damage is a tragedy despite the best intentions of some characters. The core of the novel is the universal conflict between idealism and pragmatism. We see it in the interactions of the film makers with Ravi Varmar and Samina Hakim (the Divisional Range Officer of the Forest Department), between Manu and Jayan, as well as Jayan’s wife, and between the elephant caretakers who are responsible for the Gravedigger at various stages of his life. James depicts the cruelty and kindness shown to elephants and humans — and the consequences of such treatment. Everything is other than as it seems. Dr. Varmar is not without self-interest. Samina Hakim manages the forests in which elephants are supposed to be protected from poachers and other threats to their well-being. But the Forest Department allowed the Shankar Timber Company to clear large tracts of land, which disrupted the elephants’ habitat and led some of them to stray into neighboring villages, with dire results for humans and elephants. Emma and Teddy want to create a documentary with an important message, but they also view it as a means to achieve career goals. The low-level poachers like Jayan are not without justification for their actions, which are motivated by desperate circumstances. No one is completely innocent, yet no one is utterly corrupt either. All of these conflicting impulses become entangled as the plot progresses. When he is sold to a man who owns several elephants that he rents out for various purposes, we experience his disorientation. While the characters, setting, and plot are all powerfully presented, James’s prose also stands out. It is usually direct and muscular, well suited to the story. But occasionally, her writing stretches out and becomes lyrical. Early in the book, Emma and Teddy take a taxi to meet Dr. Varma. “We careened through plantations of coffee and tea, rows of bushes ribboning over the shallow slopes, bedazzled with bright red berries. A silver oak shimmied against the wind, its trunk a smear of marigold fungus. Easier to miss were the ditches carved around the plots, meant to keep wild elephants from snacking on the berries. From time to time, a mother and calf would loot the bushes, and the calf would slip and tumble into a ditch, out of its mother’s reach.” This is writing that demands to be read aloud. When you finish The Tusk That Did the Damage you will have a more nuanced knowledge of the elephant poaching problem. What can we reasonably expect to accomplish, and how? What compromises must be made? For the elephant is not just part of the wildlife in India; it is central to the Hindu faith and the stories Indians tell about themselves, their land, and their way of life. These myths cast a shadow across much of the book, giving it the feel of a timeless fable as well as a contemporary socio-political novel. 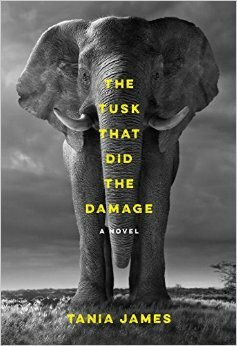 The Tusk That Did the Damage is a short, sharp shock of a book that will leave readers with much to think about. This is such an unusual book – I can see why it will stick with reader long after they finish reading. It is currently at the top of my TBR list! Yep, I’m pretty sure i have to read this. Have you read The White Bone by Barbara Gowdy? They sound kind of similar.